On 16 June 2006, when the Maoist leader Pushpa Kamal Dahal met Prime Minister Girija Prasad Koirala in Baluwatar, he was a leader of a party that had taken up arms against the Nepali state. The Maoists had joined forces with their erstwhile class enemies to lead a street movement that transformed a monolithic kingdom into a secular federal republic. Two years later in 2008, Dahal led 229 of his party comrades to occupy 38 per cent of the first Constituent Assembly that was tasked with drafting of Nepal’s new constitution. History awaited, the world was a witness and the people that had overwhelmingly voted his party to power were in anticipation. The numbers and the sentiments were both on his side. Seven years later, reduced to an opposition leader with less than 18 per cent in the same assembly, the Maoist Chairman is a bitter man who has nobody but himself to blame for allowing the history to pass him by. 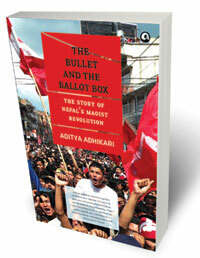 Aditya Adhikari’s recently published book, The Bullet and the Ballot Box: The Story of a Maoist Revolution, chronicling the days and nights of Nepal’s decade-long conflict, their dramatic ascendance to power and equally dramatic downfall, couldn’t have been more appositely timed. Adhikari weaves a subjective account of the personal journeys of young men and women who participated in the war to give us a microscopic understanding of the Maoist movement as it happened, and the way it spread across the rural countryside. Based on a mass of available literature on the Maoist People’s War including diaries, memoirs, interviews, articles, reports, poems and fiction writings, the author describes the backdrop of Nepal’s bloody civil war, its socio-political implications and its humanitarian consequences, on a population on the receiving end. Many of the personal memoirs, essays, poems and stories sourced in the book were published at the peak of the ‘people’s war’,which also help us gauge commitment and confusion of young men and women who joined out of sheer conviction, curiosity, and sometimes also out of fear. The excerpt from an essay by a Maoist activist about his brief encounter with the city and its dwellers, reveals his disappointment and anger at their selfishness and lack of empathy for the suffering of fellow citizens. Similarly, a letter from a young rebel assigned in Kathmandu portrays his fear and confusion during the final years of war when the state forces arrested senior leaders, forcing others into hiding for several months. But where Adhikari’s book stands out (and the reason it will also be judged) from the rest of the books written on Nepal’s conflict is where it deliberately refrains from contending narratives of the war, revealing to us the human face of those who fought and died for a dream of more equal and less discriminatory society, without passing any judgment on their beliefs. In the final chapter, Adhikari recaps the parliamentary journey of the Maoists after the ceasefire, their historic win in 2008 and demoralising defeat in 2013, which for him marks their ultimate transformation into a mainstream party that goes through ‘regular cycles of electoral victory and defeat’. 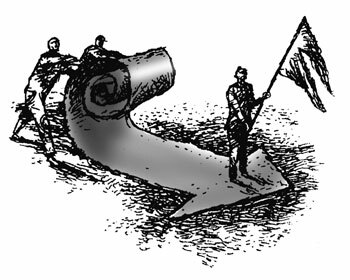 For a party that believed that political power flowed from the barrel of the gun and whose ultimate aim was to capture the state power through violent means, the Maoist decision to join competitive politics was not just a strategic move but a revolutionary transformation. In some ways, this may have been too sudden because it did not allow them sufficient time to inculcate a democratic ethos among the militant rank and file. The parliamentary exercise was built on negotiations and compromise which the party was not used to, and this unfamiliarity cost it dearly when more dogmatic rank and file parted ways. Nepal’s Maoists have lost the electoral mandate in the present CA, but their contribution in stirring Nepal’s socio-political transformation is undeniable. Their political contention on certain issues in the ongoing statute drafting may take them to the streets along with other opposition forces. But the historical task of institutionalising gains for which they braved bullets will keep them tied to the ballot. 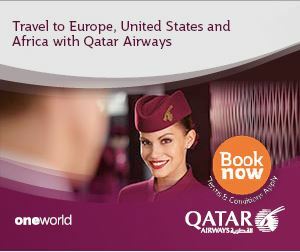 The only way to revitalise the blood-soaked earth is to seed it with faith, hope and effort. 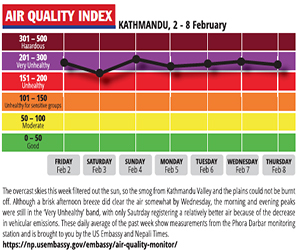 What if the Indian media applied to its own society even a tenth of the standards it has judged Nepal by? A noted Indian writer explores the moral loftiness of his countrys press.